Extensible Markup Language (XML), which provides a flexible way to define semistructured data, is a de facto standard for information exchange in the World Wide Web. The trend towards storing data in its XML format has meant a rapid growth in XML databases and the need to query them. Indexing plays a key role in improving the execution of a query. 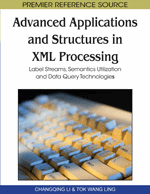 In this chapter the authors give a brief history of the creation and the development of the XML data model. They discuss the three main categories of indexes proposed in the literature to handle the XML semistructured data model and provide an evaluation of indexing schemes within these categories. Finally, they discuss limitations and open problems related to the major existing indexing schemes. XML is becoming the dominant method of exchanging data over the Internet. It was endorsed as a W3C recommendation in 1998 (Bary, Paoli, & Sperberg-McQueen, 1998). Its roots go back to SGML (Standard Generalized Markup Language) (Bary et al., 1998). XML poses a nested hierarchical nature. An example XML document is illustrated in Figure 1. It is based on DBLP (The DBLP Computer Science Bibliography, 2009), a popular computer science bibliography dataset. The data-tree shape in Figure 2 represents the data in the XML document of Figure 1. The growth in the use of XML for data exchange has led to the introduction of native XML databases to store and manage the data directly in its XML representation. Since the repetition of XML data is irregular due to missing and/or repeated arbitrary elements, its storage structure can be scattered over many different locations on the disk, which decreases the performance of XML queries (Chung, Min, & Shim, 2002). Furthermore, the flexibility of specifications of the XML queries (e.g. use of wild cards) adds to the challenge of indexing methods (Wang, Park, Fan, & Yu, 2003; Zou, Liu, & Chu, 2004). A set of common criteria to summarize the characteristics of the most popular indexing techniques used for XML databases. Classify novel classification of graph indexes that is based on the presence/degree of determinism and the bisimilarity direction(s) of indexing, which control the size of an index and its query answering power, respectively. Retrieval power: Which includes the precision and completeness of the result, and the type of queries supported. Processing complexity: Which involves the need to compute the relationship between elements (such as the parent/child and the ancestor/descendent relationships), the need for structural joins to answer a query, and the need for additional refinement steps to fine-tune answers. Scalability of the index and its adaptability to queries with different path lengths. Update cost: Which is measured by the number of nodes that are touched during update. XML documents can be represented as directed graphs. For example, the directed graph in Figure 2 represents the XML document in Figure 1. The “mapping” of an XML document to a graph may result in an acyclic graph (e.g. Figure 2), which is tree shaped, or in a cyclic graph (if ID/IDREF tokens are used). While some indexes support all graph data (cyclic and acyclic graphs), others only support tree-shaped data. In this section, we review two common models for semistructured documents and the XPath query language, which is used in this chapter to express queries.